I really detest deer, I've had my hiking poles stolen one too many times and have suffered through about 40 too many camp raids at 2 A.M. to feel anything but hate in my heart for the cervine larcenists. My antipathy towards the antlered devils even triggers involuntary conniption fits whenever I hear the phrase "North Bank Deer Habitat", even though I hike there often. "But fawns are cute" I am told. Well, you shouldn't have kittens if you don't like cats. As a person who regularly gets tormented by a singularly annoying cat that I can't hurt because it belongs to my wife, I don't have kittens. And following that same logic, I don't have fawns, either, because they are sure to grow up to be hiking-pole stealing adult deer. So deep is my loathing of all things deer, that I nearly didn't want to ever hike to Fawn Lake ever, just because of the name. But what's in a name, anyway? Not much, in the case of Fawn Lake. The lake is an absolute gem of a lake sparkling in the midst of all the scrawny lodgepole trees and dusty pumice soil so prevalent on the east side of the Cascades. I'd even go there again, in spite of its titular homage to baby deer. 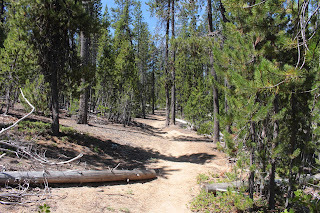 Starting at the Crescent Lake boat ramp parking lot, the trail went dusty at the outset as it wandered through sparse woods before crossing paved Forest Road 60. 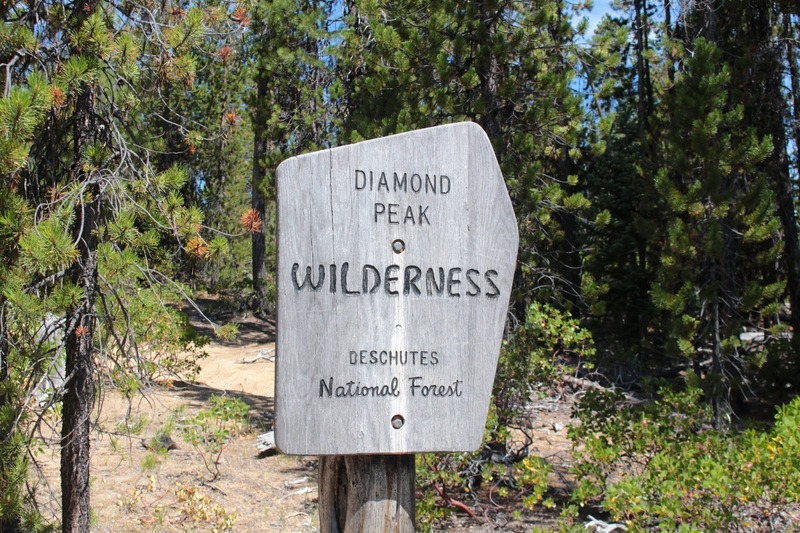 Once across the road, the trail entered the Diamond Peak Wilderness and became a real hike, with mosquitoes and everything. Deet was quickly slathered on to ward off the airborne school of six-legged piranhas. Angling gently uphill for all of its 3.7 miles, the trail passed through viewless forest consisting of mostly spindly lodgepole pine trees. 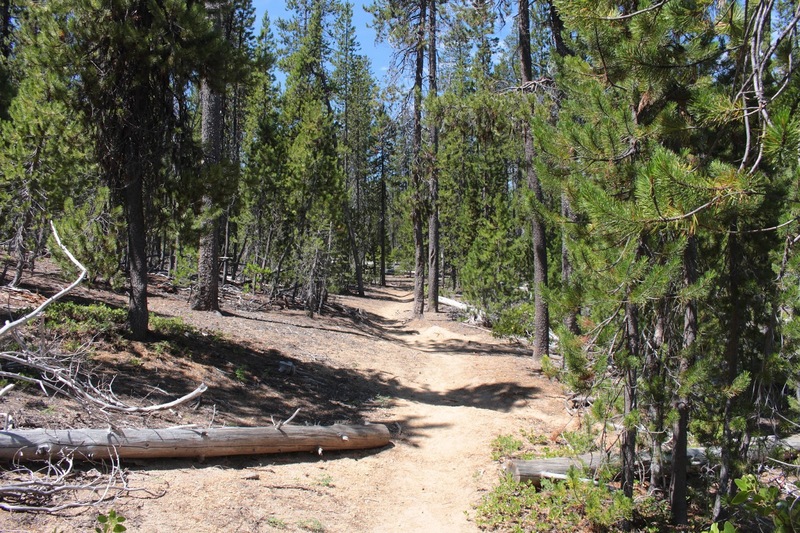 At just under the one mile mark, the Fawn Lake Trail intersected with the Pretty Lake Trail. My guidebook said the Pretty Lake Trail was unmaintained and sketchy but it looked like it's seen the love lately as it was wide, clear of fallen trees and brush, and with trail tread well tromped out by lots of hiker boots. I think I just found my return route back from Fawn Lake! There wasn't a lot to see on the way up. 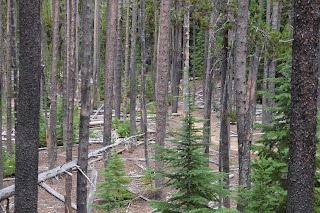 It was hot and the forest was full of mosquitoes so mostly, I kept my head down and just trudged uphill. 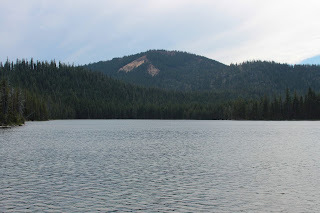 It was quite jarring when the trail, without warning or preamble, just bumped into Fawn Lake, where I plopped down to enjoy the view and eat lunch while slapping at mosquitoes brave enough to drill past the thick layer of Deet on my skin. This lake really is a jewel. At the far end of the lake, rose the scenic and craggy twin peaks of aptly named Lakeview Mountain and generically named Peak 6892. To the left, was cliffy Redtop Mountain. 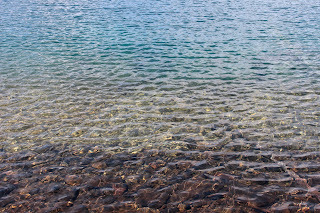 A soft breeze blew and sunlight sparkled on the on the rippled surface. Dragonflies and butterflies flitted to and fro, alighting occasionally on the shoreline vegetation. 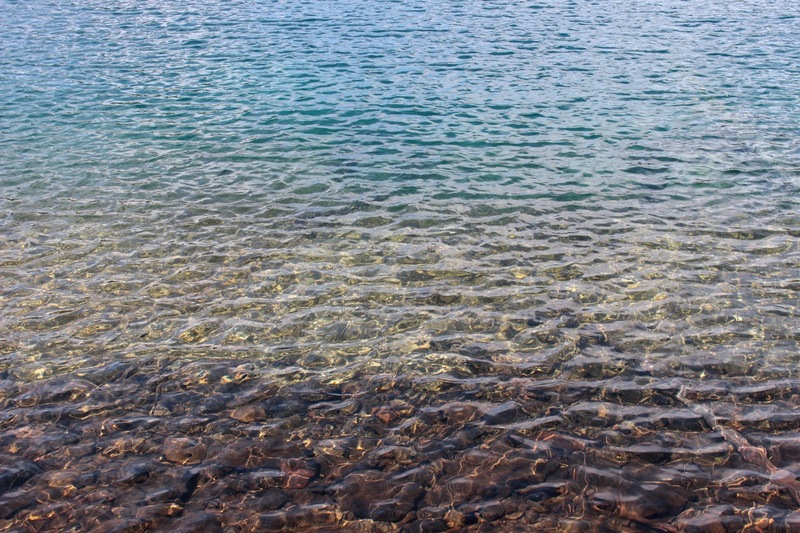 The cold water was amazingly clear and a myriad of water boatmen (a small aquatic bug) paddled their oars just underneath the lake's surface. Unbelievable that such a pretty lake could actually be named after devil deer spawn. 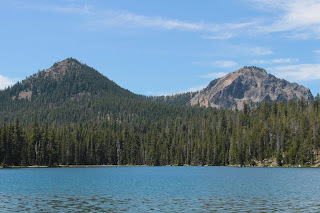 Speaking of pretty lakes, after lunch I resumed hiking along Fawn Lake's southern shore with the intent of hiking to nearby Pretty Lake and then returning on the steep, but downhill, Pretty Lake Trail back to the Fawn Lake Trail. Hiking was slow along Fawn Lake because each new bend in the trail provided yet another different look at the lake and each time, I just had to bushwhack down to the lake for a look-see. 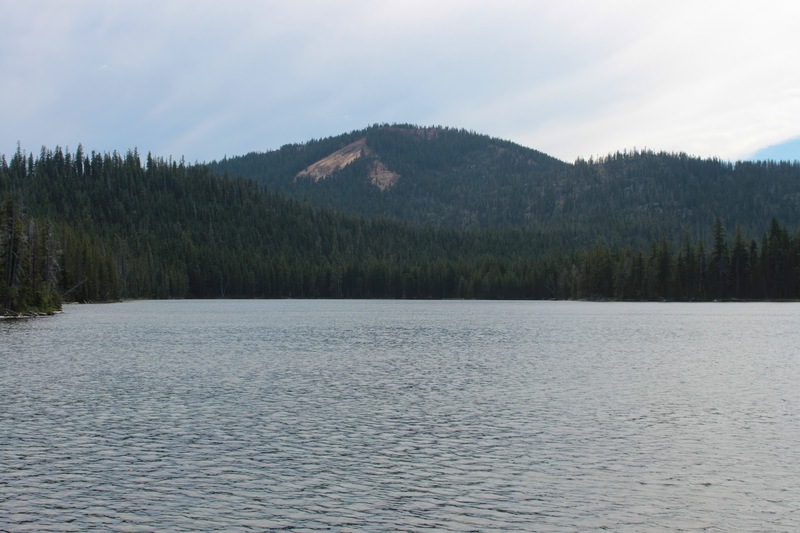 The far end of Fawn Lake was particular scenic, providing a closer look at Lakeview Mountain. 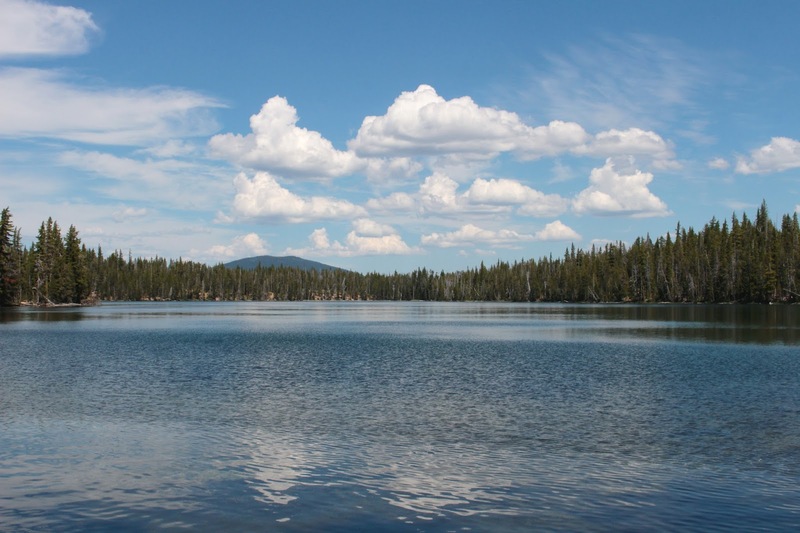 Fawn Lake was visible in its entirety, and puffy white clouds formed in a blue sky above the lake. Much photography ensued. Boom! A loud clap of thunder got my immediate attention. Seems those puffy white clouds were the precursors to thunderheads that were blowing in from behind me while I had been distracted by Fawn Lake. It took like only 10 minutes for the day to switch from hot and sunny, to hot and stormy. The rumbling of thunder was now a constant and it was like hiking in the bowling alley of the gods. I'm not sure who Prudence is but prudence dictated I seek lower elevation immediately. 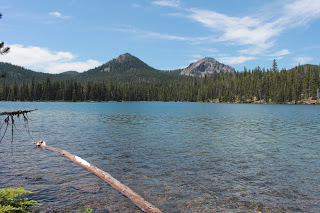 Since Pretty Lake was higher in elevation than Fawn Lake, rather than loop it back on the Pretty Lake Trail, it was back the way I came on the Fawn Lake Trail. There's no real upside, that I can think of, to getting pretty electrocuted at Pretty Lake. 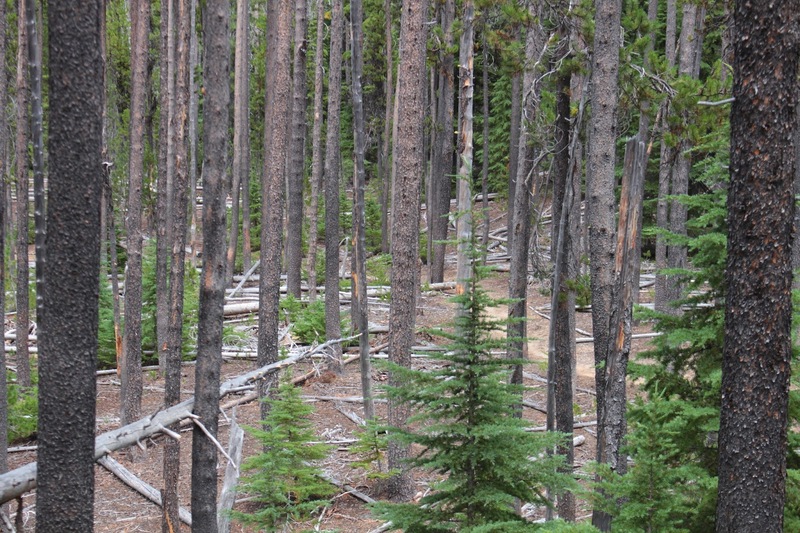 Lodgepole forest is not particularly scenic. Lodgepole trees tend to grow in poor soils where no other tree will grow, so a lodgepole forest will invariably consist of trees that are thin, scrawny, and spindly. Because of the poor soil, there generally is not a lot of undergrowth. 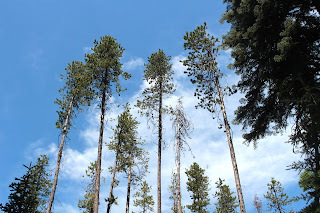 I didn't take a lot of pictures of the forest because there really isn't much to take pictures of in a lodgepole forest. Plus. coming up the trail I had mostly focused on trudging uphill while sweat, sunscreen, and Deet dripped onto my stinging eyes as I cursed mosquitoes. But on the easier hike downhill, I discovered there really was a lot to see. The heterotrophic plant community was having a heyday, emerging from the pumice soils in abundance. 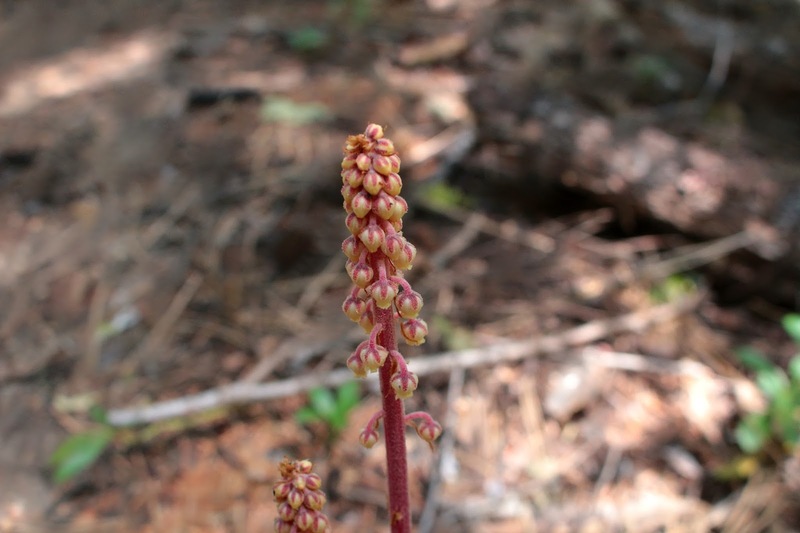 Pinesap was everywhere, sprouting in dense clumps while less common pinedrops were scattered here and there in comparatively more stately and elegant stalks. Much rarer were the seldom-seen gnome plant and I was fortunate to find a couple of clumps flowering pretty much upon emergence from below. In all my years of hiking, I had never seen gnome plants and now this was the second summer in a row I've run into these little oddities. "What is a heterotroph?" you ask? Well, maybe you didn't ask, but I'll tell you anyway. Heterotrophs are plants that lack chlorophyll and hence, are unable to make food from sunlight. 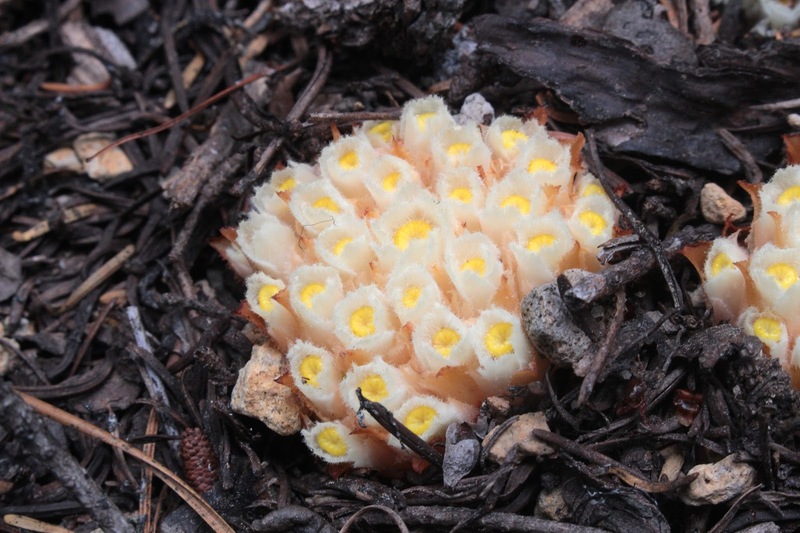 Therefore, they must obtain nutrients by parasitizing upon nearby tree roots, probably lodgepole trees in this case. Anyway, I spent a lot of time at ground level, taking pictures of pinesap, pinedrops, gnome plants, and candystick. 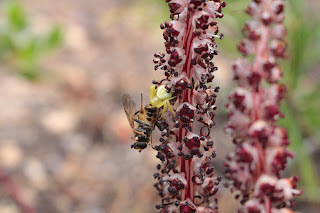 On one candystick, a crab spider had ambushed a bee and I got a cool picture of the insectile murder. The bee didn't think it was all that cool, though. Boom! Dang thunder interrupted my photo shoot! The rumbling was getting louder and louder so I walked pretty fast down through the forest. Fairly often, I'd stop to take a photo of something and the electricity gods let me know their displeasure by startling me with a loud clap of thunder. But at least they weren't hurling thunderbolts...yet. 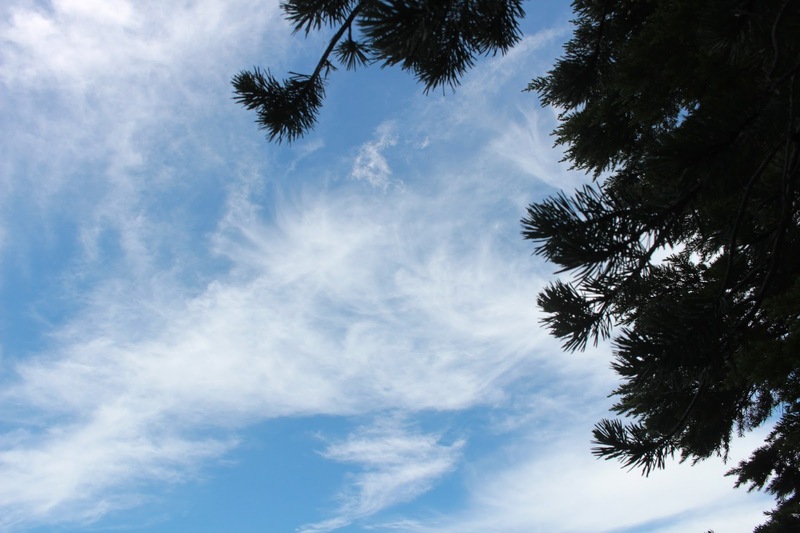 At the parking lot, the cloud formations were truly spectacular. 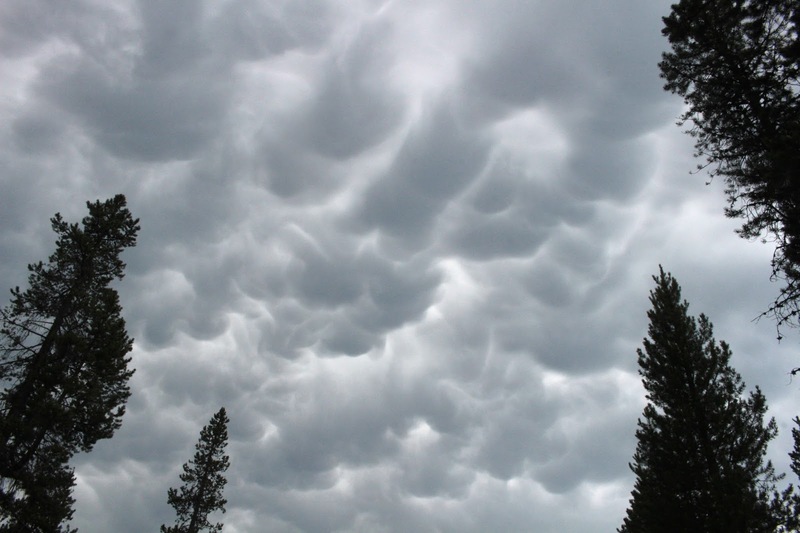 Mammatus clouds are, according to Wikipedia, "sagging pouch structures" on a cloud. Basically, mammatus clouds are the soft dark sagging underbelly pouch-structure of a thunderhead cloud. 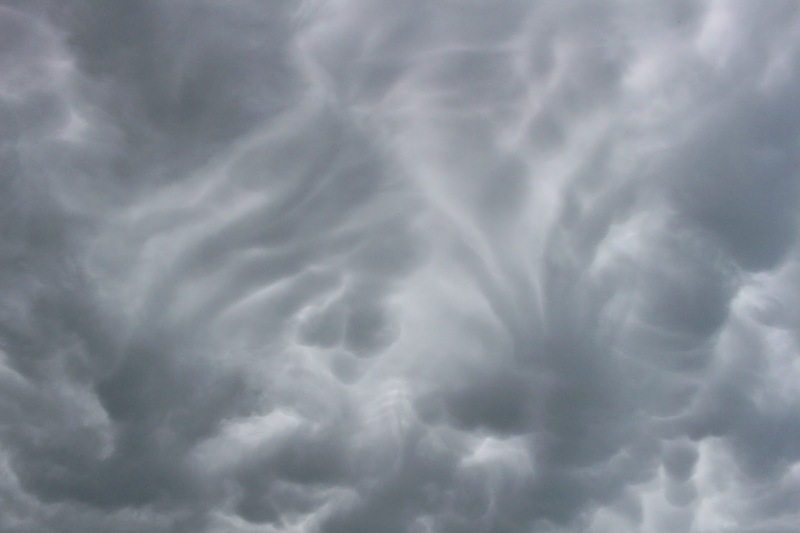 My thought, on seeing these clouds, were that they were less sagging pouch structures (I have a few of those too, by the way) and more like celestial bubble wrap. That would explain how thunder gets made, too: Thunder is merely the sound of gods popping bubble wrap. At any rate, this was a nice little hike in spite of the deer-based name. 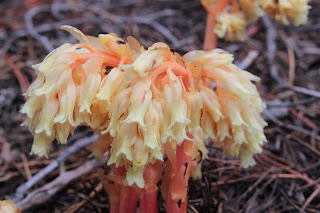 For more pictures of this hike, please visit the Flickr album.